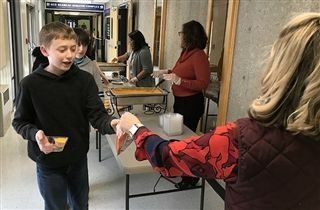 On Friday, February 1, middle school students were surprised with a fun-filled afternoon that included some special treats at lunch and a movie in the KCD Theater in lieu of afternoon classes. The middle school faculty came up with the idea as a way to show appreciation to the students for all of their hard work over the last several weeks. This was a fun and exciting way for the students to end their week.